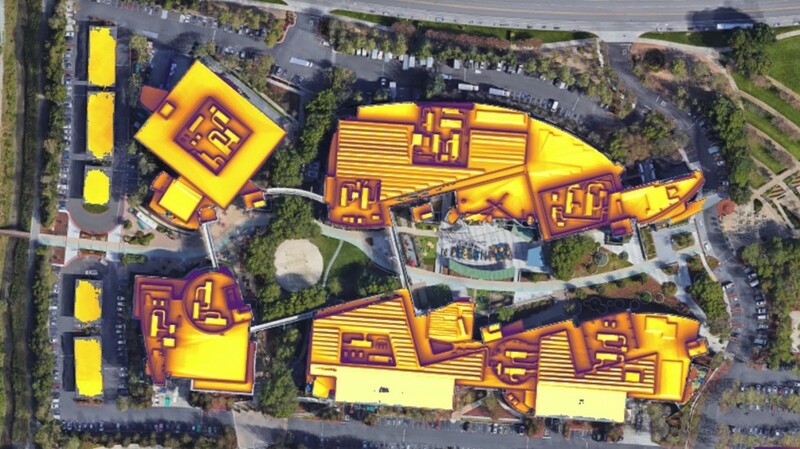 Google has updated its Project Sunroof to include 3-D models of every rooftop in all 50 states. The new software takes into consideration the trees on your property, how much sun or shade hits your rooftop, and figured in the prevailing weather in your area. Then it takes all that data and builds a computer model that tells people how much electricity a rooftop solar system could if the homeowner decides to acquire one. Google’s campus in Mountain View, California as seen by new Project Sunroof tool. The new software program has determined that 80% of all US rooftops are “technically viable ” for rooftop solar. Some locations are more “viable” than others, of course. Houston, Texas is judged to be the best American city for rooftop solar power. Project Sunroof says that city could generate up to 18,940 gigawatt-hours of solar electricity each year. One gigawatt-hour is enough to power 90 ordinary homes. Project Sunroof lets you search for your house, suggests how large a solar array you might consider putting on your roof, and estimates how much energy it will generate. It also estimates how much it would cost you to lease or buy the panels. Rooftop solar is slowing down across the United States. Residential installations grew just 19 percent last year, mostly because demand is drying up in big state markets like California. In a new report, the Solar Energy Industries Association predicts that the 5 states that saw the biggest increase in rooftop systems in 2016 will all experience drop-offs in their growth rates in the coming year. Some of the slowdown can be attributed to changes in net metering policies in several states. Utility companies have been successful at getting state regulators to reduce or eliminate the amount of money they have to pay residential customers for the electricity they add to the grid. The SEIA report said one reason things are slowing down is that solar installers have had difficulty “reaching customers outside of the early adopters.” That’s one area where Google’s new Project Sunroof tool could prove to be valuable to homeowners and the rooftop solar industry.